A musician, chemist, and aspiring physician-scientist – Deondre “Dre” Jordan ’19 will graduate next semester with an Honors major in Chemistry and an Honors minor in Music. He plans on carrying both passions into his life after graduation, hoping to gain research experience, earn a M.D./Ph.D, sing in an advanced chorus, and compose his own music. Dre became involved with Swarthmore’s Music Program well before he enrolled as a student. Dre sang in the Chester Children’s Chorus while in middle school, attending rehearsals and learning programs on the college campus. Dre even recalls working with Professor Andrew Hauze when Hauze was still a Swarthmore student. 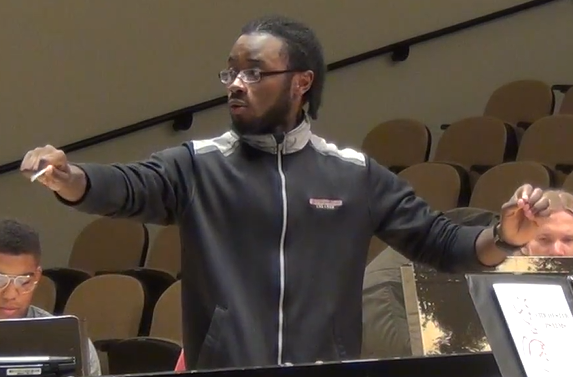 When Dre reached his third year of high school, he joined the Swarthmore College Chorus where he grew close to many of the college’s music faculty, especially Chorus conductor Joe Gregorio. By the time Dre enrolled in the college, much of the music faculty were already “like family” to him, which only intensified his motivation to remain in the College Chorus and join the Garnet Singers. Even though his desired professional career focuses more on chemistry than music, Dre believes that the skills he has developed as a musician at Swarthmore will help him thrive as a physician-scientist. Music has taught him how to not only understand emotion, but more importantly, how to express emotion clearly and professionally. He has learned how to sustain an appropriate degree of vulnerability while remaining personable to his audience. Dre realizes how important it is for a physician to have a mastery of these qualities, so they are things that he’ll carry in whatever he does, especially in treating patients. For now, Dre plans to stay active in the Music Program. He starts a new position this semester as the College Chorus’s assistant conductor, and is currently learning musical conducting and more advanced music theory under Joe Gregorio. As a singer for most of his life, Dre is excited to take on this “different but important role.” His experiences and knowledge gained thus far have already made Dre “grow so much as a musician”, and he is “infinitely grateful” not just for this new position, but for all the opportunities Swarthmore has given him throughout his life to pursue music. This entry was posted in Music on October 2, 2018 by dpulley1.